Shows featuring Alejandra Pablos | Democracy Now! 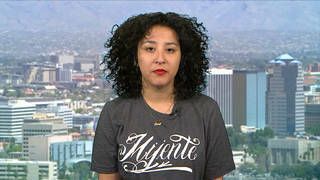 Reproductive justice and immigrant rights activist who works for the National Latina Institute for Reproductive Health. She is a member of We Testify, an abortion storytelling leadership program of the National Network of Abortion Funds. She was released from ICE custody last week, after being detained after a regular ICE check-in.